Shelly this is just adorable. Great coloring. This is adorable Shelly! That image is so cute and you've colored it perfectly. Great to get a free image. The twins got into Early Head Start. They are helping with developmental delays. They are about 2 months behind in development. Just started to crawl and they are getting fast. Arthur is pulling himself up to stand but Valerie isn't yet. Can't believe they are growing so quickly and a almost a year old already. Yikes! Oh Shelly... what a sweet card! Just adorable! 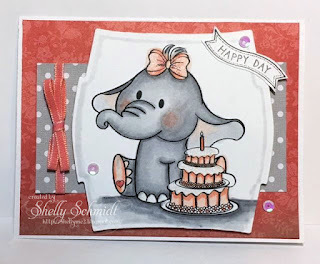 This is a great card Shelley and you did a fab job colouring that sweet elephant. It's a perfect birthday card for a little girl. Fabulous card and such an adorable image. Your coloring is fantastic. Absolutely precious, Shelly! 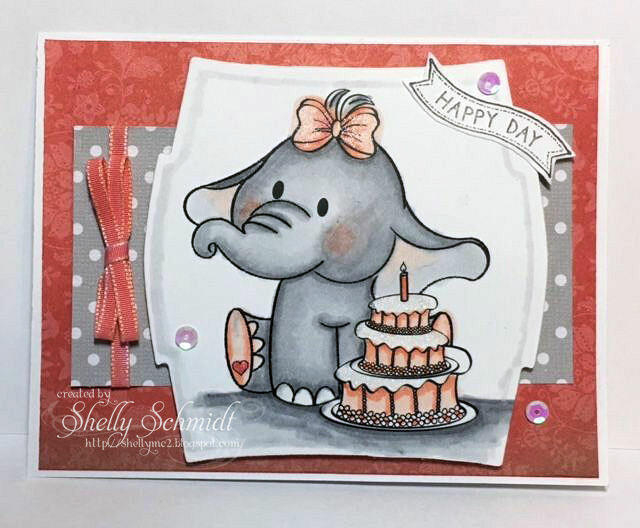 I love the awesome colors you have used to showcase this adorable elephant! !